Last weekend I made it in to the money on the Sunday Million and have been grinding hyper-turbo sattelites. Played 7364 $87.72 tournaments so far and I'm up $7286. Played 287 $216.24 tournaments so far and I'm down $1535 at those. Yesterday managed to play 1000 tournaments in 8.1 hours! 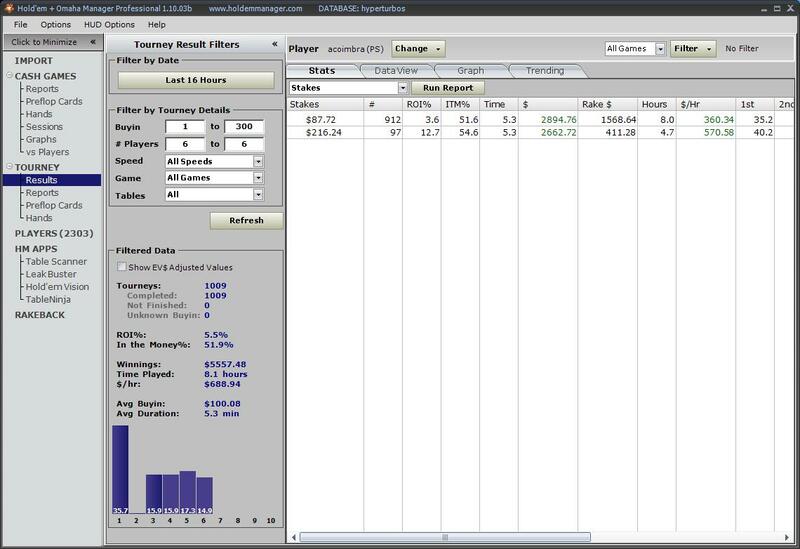 I think that's only possible to do at PokerStars, other rooms have worse software for multitable and less traffic on these stakes. I will keep grinding the $87.72 and $216.24 during the next week, as I get many VPPs playing these and I want to get 1M VPPs by the 1st of October, in order to not get downgraded to SuperNova this year. This Sunday I will play the Sunday Warmup, Sunday Million, Turbo Takedown and Battle of the Planets (have 12 tickets :P). See you guys on the tables! 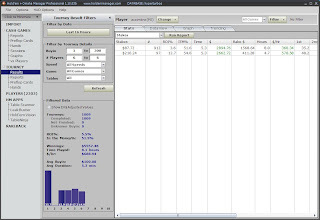 Lately I've been playing the hyper-turbo sattelites from Monday to Friday and The PokerStars Sunday Multi-Table Tournaments. Didn't get any good score at the MTTs and after 2266 HT I'm down $2866 (not counting my fpps), so haven't been doing well this month so far. I will play more 2734 hts and then decide if I want to keep playing or not. Regarding the MTT, I'm getting better, but they are really hard and the variance is huge because I play mostly big fields. Since my last post I went to San Diego to play the MTG Pro Tour. For the first time I did 0-4 drop, but it didn't really bother me. I blame lack of practice and timezone difference for the result. During March I plan to learn how to play the hyper turbo satellites on PokerStars and I will give up if I don't like my results after 5000 sngs or if I lose 200 buy-ins. The plan is to play and review everything on sngwizard. I will try to post on a weekly basis in this blog.